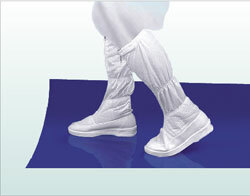 Sticky Mats is dirt grabbing mat to lift dirt and debris from shoes and wheels, but it will not leave a residue. Each mat has 30 sheets of exposed low-tack adhesive that collects and prevent foot traffic contamination. Peel top sheet away to reveal the next clean layer. Heavy duty non-skid base is available for use with 24” pads, and it prevents slipping and allows for easy relocation of entire system.